• الموضوع : The Ambassador of the United Arab Emirates, extended an invitation to Dr Mohamad Ali El Husseini to participate in the World Conference on Muslim Minorities in Abu Dhabi . 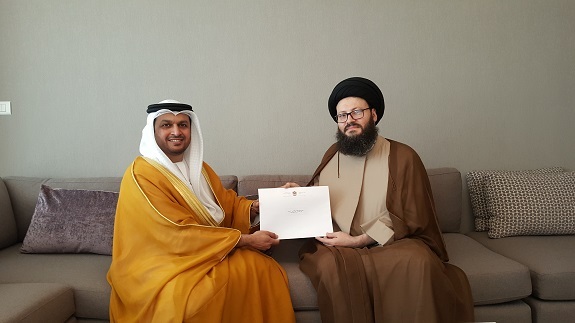 The Secretary-General of the Arab Islamic Council, Dr. Mohamad Ali El Husseini, met with the Ambassador of the United Arab Emirates in Lebanon Hamad Al Shamsi, who presented him with an invitation to participate in the World Conference on Muslim Minorities under the theme "The Future of Muslim Minorities: Opportunities and Challenges" to be held in Abu Dhabi this month. El Husseini welcomed this good initiative and promised Al Shamsi to accept the generous invitation which shows the UAE's interest in the Muslim minority in the world and is keen to promote the true values ​​of Islam such as recognition of the other, dialogue, tolerance and moderation. El Husseini expressed his confidence that this conference will achieve its objectives in serving the Islamic message as a global call for peaceful coexistence and dialogue of civilizations. He stressed that the choice of Abu Dhabi as a venue for the conference and the high level of its participants contribute to its success.